Loss of vision can be prevented through regular eye examinations. It’s important that you understand what glaucoma is and what you can do to prevent unnecessary vision loss! Glaucoma is the second leading causes of blindness in adults in the United States. Most people think of glaucoma as one disease. Actually, it is a group of diseases that causes damage to the optic nerve, a bundle of more than a million nerve fibers at the back of your eyes. This nerve is like a “cable” that transmits “pictures” from your eyes to your brain. If you have glaucoma and it is not treated appropriately, the damage to the optic nerve can result in loss of vision and blindness. According to the Glaucoma Research Foundation, the most common type of glaucoma affects about 3 million Americans – and about half of them don’t know it! These people may be unaware that they have glaucoma, as there may be no obvious symptoms in the early stages, however, damage to the optic nerve may be occurring. 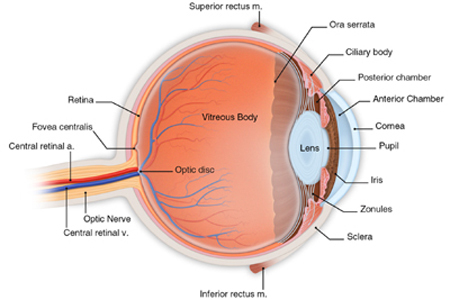 When damage to the optic nerve occurs, blind spots develop. By the time someone is aware of these blind spots, the optic nerve has been significantly damaged. They also recommend that anyone with high risk factors (see below) be tested every year after age 35-40. For this reason, the NEI recommends that everyone over the age of 60 and African Americans over the age of 40 have comprehensive eye examinations. Seeing your ophthalmologist and having regular eye exams is the best way to detect glaucoma. It is estimated that 60-70 percent of glaucoma cases are detected during routine screening. Since the risk of glaucoma increases as you grow older, regular eye examinations are an important part of protecting your vision. We recommend annual eye examinations beginning at age 55, or age 40 for patients with a family history of the disease. Many people think that just checking the eye pressure will determine if you have glaucoma. This isn’t true, although having elevated eye pressure is a risk factor. ​Depending on the results of these tests, taking photographs of your optic nerve or other computerized imaging such as Optical Coherence Tomography may also take place. It’s important to remember that testing isn’t just done once; it must be repeated at regular intervals to monitor any changes in your eyes. Since glaucoma damage usually can’t be reversed, it’s important for the health of your eyes to detect the earliest signs of problems, so that treatment can be initiated to minimize potential vision loss. With our aging population, the number of people with glaucoma is expected to increase significantly over the next decade. Fortunately, early detection and rigorous adherence to treatment will be the keys to preserving vision.